Germany notched up a third successive win in FIFA World Cup qualifying Group C after first-half goals from Julian Draxler and Sami Khedira paved the way to a straightforward win against Northern Ireland. Enjoy the Bundesliga in the palm of your hand - download the Official Bundesliga app! 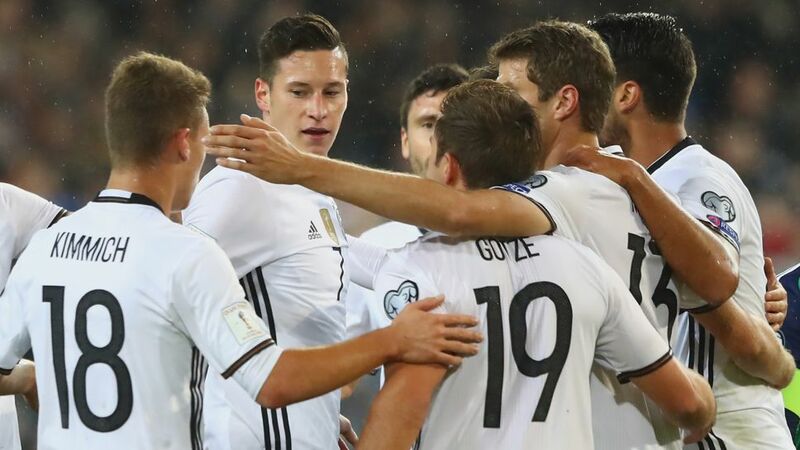 Germany boasted their best-ever start to a FIFA World Cup qualifying campaign having previously posted successive 3-0 victories in the section against Norway and the Czech Republic. The defending champions quickly continued that fine run of form when Draxler sent a slick, right-footed shot from the edge of the area away from goalkeeper Michael McGovern and into the corner of the net. Khedira doubled the hosts' lead a few minutes later, the Juventus midfielder glancing home a Mats Hummels header from Mesut Özil's centre. Fancy Draxler in your Official Fantasy Bundesliga Team? Sign him up now! Northern Ireland had conceded just three goals in their previous nine games prior to their trip to Germany, yet the visitors were in danger of matching that figure shortly after the restart. Sami Khedira followed a tame volley at McGovern with a shot from distance that edged narrowly away from goal. Joachim Löw's team continued to press, with Khedira again finding himself the target man. However, the former VfB Stuttgart schemer again missed, this time with a wayward header. In the end, the home team's second-half profligacy mattered little as the current world champions maintained their perfect start to Group C.
Draxler capped off an industrious performance down Germany's left with a sweetly struck goal to give his team the lead. Always eager to receive possession and showing some fine interlinking play with his attack-minded team-mates, the 23-year-old's showing will deliver a timely confidence boost as he returns to domestic action with VfL Wolfsburg. Manuel Neuer has kept ten clean sheets in his last 13 games for club and country. Die Mannschaft have now won their last seven games in Hanover.Thomas Müller remains one goal behind tenth-placed Oliver Bierhoff on Germany's all-time goalscorers' list. Germany: Neuer (c) - Kimmich, Boateng (Mustafi 69), Hummels, Hector (Volland 81) - Khedira, Kroos - Müller, Özil (Gündogan 46), Draxler - Götze. Northern Ireland: McGovern - Hughes, McAuley, Evans - Hodson, Ferguson - Davis (c) - Evans, Norwood (McNair 73)- Ward (McGinn 61)- Magennis (Lafferty 76).